Brand New Luxury Holiday Studio Apartment. Located meters to Lake Wendouree on popular Gregory Street. This purpose built, modern, two story luxury studio apartment will impress. 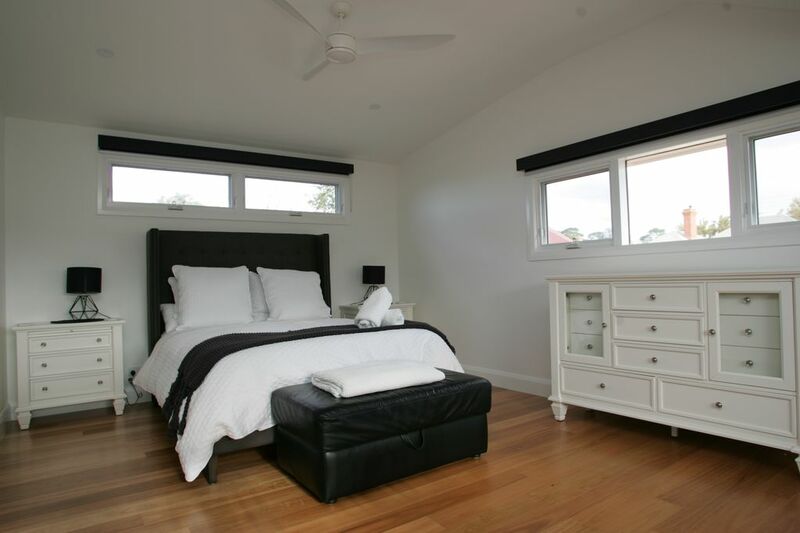 A great location for your Ballarat holiday stay. Down stairs has a single over double bunk bed with its own bathroom. Upstairs is open plan living with full kitchen, living, dinning, bathroom and bedroom with a queen size bed. With private entrance and off street parking available. Will sleep single family unit up to six people. Amenities include air-conditioning, gas log fire, ceiling fans and outdoor garden area. Situated walking distance from Lake Wendouree, Ballarat Botanical Gardens, Australian Ex-POW Memorial and Tramway Museum. Close to shopping centre, Transportation, Cafe's and the centre of Ballarat. Kevin is an excellent host. His place is simply the best. It is well appointed with the best of everything. Will hopefully use again. Beautiful apartment that makes you feel comfortable as soon as you walk in. The owners have thought of everything to make the stay as comfortable if possible for the guest. I will highly recommend and would stay there again. Thanks for your positive review, glad you enjoyed the concert at Lake Wendouree. We had a walk around the lake while the concert was on and have heard positive reviews of the performances. Modern apartment, great amenities, wonderful location, clean and tidy, helpful host and added special extras. Thanks for your positive review, glad you had an enjoyable stay. We hope to see you back again. We have stayed at a number of 'HomeAway' properties but this by far was the best. Well presented with quality fixtures and fittings. Even the linen, towels etc were top quality. The host Kevin even stocked the fridge with milk and crumpets for the first morning breakfast and also proved a lovely fresh fruitbowl. Pleasant and unexpected nice touches. Would highly recommend. Thanks for your kind review, you are welcome back anytime. We are keen to host people involved in the bike events. Great location, quality property with a warm welcome. We had a 2 night stay at Kevin's property over the New Year period and was thankful that all details were considered, and more importantly the location to the Lake is unbeatable. Glad you enjoyed your stay at our studio and its proximity to Lake Wendouree and the Botanical Gardens. We had a fantastic stay in this townhouse - such a beautiful place. Extra inclusions such as fridge supplies were very welcome. Thanks for being so accommodating. Thanks for your review, glad you had a fantastic stay and we look forward to a return visit. Lots to do and see in Ballarat.